are a pair of colliding spiral galaxies 50,000,000 light-years distant, which were discovered by John Herschel. 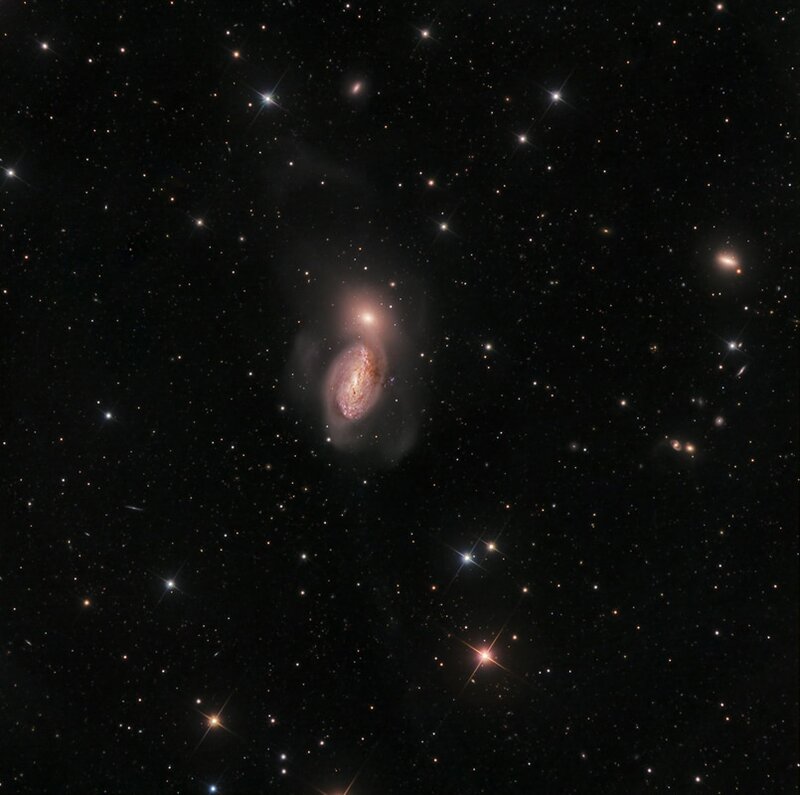 Also classified by Halton Arp as Arp 94, The larger face-on galaxy below, NGC 3227, is an unbarred SAB(s) pec(uliar) spiral, while the smaller galaxy above, NGC 3226, is a dwarf elliptical. The interaction between the two galaxies is visible as spectacular loops, arcs, and star streams that are the remnants of an ongoing gravitational dance between the two. Both galaxies' nuclei are considered AGN (active galactic nucleus), while NGC 3227's is a Seyfert-type nucleus, with variable X-ray emission. It also likely contains a supermassive black hole. I believe I may have spectral evidence that the pair are much ruddier than has been previously displayed. Several small but fascinating galaxies appear at right, including face-on PGC 30397 at 3 o'clock. ​This data was acquired by SSRO in 2017.